Crockett-Rodeo United to Defend the Environment | C.R.U.D.E. P66 is seeking a permit to increase its current daily incoming limit of 78,818 barrels of crude a day — by ship — to 130,000 barrels a day. So how does that translate in terms of the number of ships per year? The number of tankers docking at the Rodeo P66 marina will double: from 59 to a total of 135. The amounts have increased incrementally over the past five years. To put this in proper perspective: If this permit is granted, the amount of crude oil delivered to the refinery by ship will surpass the 2012 limit by 75%. The refinery claims it will replace the oil it receives from the pipeline. Oddly enough, it remains silent as to when, if ever, it intends to close the Nipomo-Rodeo pipeline. A couple of years ago, BAAQMD originally planned its only EIR scoping meeting to be held in the town Hercules. 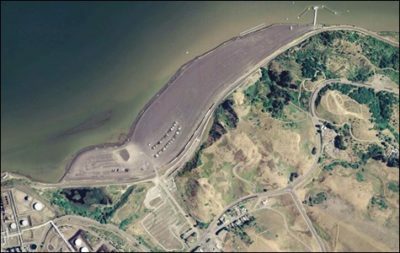 For reason unclear to the P66 fenceline communities closest to the marine terminal, BAAQMD chose not to hold its scoping session in either Crockett or Rodeo. Vallejo residents who attended the Hercules scoping session demanded a scoping session in Vallejo. Vallejo was hit hard by the 2016 marine terminal spill. That spill led over 100 people to seek medical treatment and over 1,000 folks to file complaints. They got a scoping hearing and the deadline for written public comments was pushed back. Not too long after that, Solano County supervisor Monica Brown held a town hall meeting in Benicia and invited BAAQMD to present the project in Benicia. It was filmed and edited by an activist in Benicia, Constance Beutel. The link to the youtube video is below. The Cap and Trade law that allows that refineries to go forth with “extreme oil” projects in exchange for extra cash to State that will be spent elsewhere. Again, many thanks to Constance Beutel who made the videotape and gave us permission to share it on our website. The Phillips refinery also has a poor track record of oil spills: one in 2016 and then another in 2017. In 2016, oil spilled during the unloading of a tanker ship, causing large oil slicks in the northern part of the San Francisco Bay. Over 100 nearby residents in Vallejo sought treatment at hospital emergency rooms for exposure to unidentified fumes. Officials urged community members to stay indoors with their windows closed. Initially, the refinery denied any responsibility and finally admitted culpability when a chemical analysis compared the oil in the ship to the oil in the water and determined it was a match. Suffice it to say, doubling the number of oil tankers in the Bay headed to Phillips 66 will increase the risk of spills. What’s more, the oil tankers will need to navigate through a shipping channel in the Bay that, back in 2017, was scheduled for less frequent dredging than in the past, due to new budget concerns raised by the U.S. Army Corps of Engineers. While the exact effects of reduced dredging on tanker traffic are unclear, it is possible that the risk of tankers running aground will increase. It is presumed that the proposal to increase the number of oil tankers arriving at Phillips’ Rodeo refinery up here in San Francisco Bay was due to Phillips’ failed effort to expand its operations in San Luis Obispo. The San Luis Obispo City Council, in a move to protect their community from spills and the health impacts of additional refining, rejected Phillips’ proposal to transport more oil by train to San Luis Obispo for refining and export. The lead agency for this project, the State of California Department of Toxic Substances Control (DTSC) presented an EIR for the cleanup/remediation of this capped Superfund site. The project involves the dredging of the cove where P66’s marine terminal is sited. A small portion of the”capped” land is owned by a subsidiary company of ConocoPhillips. The rest is owned by the California State Land Commission. Most of the costs of the dredging of the cove and the remediation of the adjacent land will be funded by the state/taxpayers (80%). The ConocoPhillips subsidiary will fund only a small portion of the cleanup (20%). The cove’s toxic mud has lain dormant for decades, as has any interest in cleaning up the site by the two landowners involved. Until now. There are two property owners of the capped slag land adjacent to the cove. A subsidiary of ConocoPhillips owns 20%. California State Land Commission owns 80% and has leased its portion of the slag to the ConocoPhillips subsidiary. The State will bear 80% of the cleanup costs of the slag. ConocoPhillips subsidiary will pick up 20% of the tab. To date (3/1) the State has yet to provide a map of the slag that delineates the two ownership parcels. At a public meeting in Crockett, residents inquired if there were land use limitations of the now vacant slag site. The State officials indicated that building industrial structures atop the slag was allowable. It all begs the question: Does P66 have plans to build industrial infrastructure on the slag to support its marine terminal that that is slated host twice as many tankers? If that were to be true, it raises the following key question: Did P66 manage to get two completely different agencies — regional (BAAQMD and State (DTSC) — to submit two EIRS for what might turn out to be different parts of one project? While the “big picture” slowly unfolds, there is one thing do we know for sure: A tar sands oil spill from just one tanker would devastate San Francisco Bay’s ecological system and dwarf any threat from the toxins held in the dirt which the DTSC now wants to clean up, after, lo, these many years. From 1872-1971 it was a site of metal smelting (for copper, gold, silver, and lead) and sulfuric acid production. The remaining covered-up sulfuric acid pits are on a 200-foot shelf of land that intrudes directly into the Bay. These pits are constantly liberating toxic heavy metal “leachate” from the slag into unprotected bay waters. The Phillips 66 refinery just happens to own this portion of the site. Previous remediation efforts included dredging some contaminated slag and capping the site with asphalt. But there’s still more to be done to protect the bay’s various communities, human and aquatic. Neighboring residents are concerned that the proposed cleanup would further contaminate bay waters and bring even more toxic exposure their way. A bayside wall has been proposed to stop the steady flow of contamination. Sounds great, except that it would be made from interlocking sheet metal posts and embedded into old bay mud, instead of the underlying bedrock. The metal wall would be exposed to strong acid and would have only a short designated 25-year lifespan (when finished in 2023). It certainly would not protect the acidified slag from sea-level rise past 2050. The Selby Slag Site is laced with huge amounts of health-damaging lead, zinc, copper, arsenic, antimony, cadmium, and nickel. It needs to be cleaned up for real and not receive a short-term 25-year band-aid, a leaky wall with a limited lifespan. Instead of proposing to remove the whole slag pile, State planners and Phillips 66 are offering a partial solution. They have even excluded an effective alternative—removing a much smaller portion of the slag that contains the most toxic and acidic material. The land is currently owned by C.S. Land, Inc. (CSLI, a subsidiary of Phillips 66), and the California State Lands Commission (CSLC), co-owned by agreement. The prior owner “Selby Smelting Co.” (ASARCO) and the current owners are responsible for cleanup. Let’s make sure that cleanup is thorough. 100 year-worthy seawall needs to be embedded into underlying bedrock and safe from sea level rise. The acidified, most toxic portion of the slag and the remnant sulfuric acid, should be removed entirely and safely from the Rodeo site. And here are some urgent questions you can raise the next time your paths cross paths with anyone working on the project. Jayantha Randeni, P.E., Senior Hazardous Substances Engineer, Project Manager. Not that long ago, Phillips 66 proposed to expand its operations into what is now called a refinery “modernization project.” The refinery planned to collect the propane and butane that was being burned or gassed off at the refinery, and instead, store it in tanks along the waterfront before shipping to overseas markets. It looked good on paper, but there was a problem… a really big problem: Both propane and butane are highly explosive gases. Phillips 66 planned to store 630,000 gallons of liquid propane and butane in six bullet tanks along the earthquake liquefaction zone., a mere 2300 feet away from residents. Each tank would potentially be a large bomb, with blast zones extending more than a mile away. The other problem? It was a Tar Sands refining project. In this expansion project, Tar Sands Bitumen from Alberta Canada was to be shipped by both sea and train to the “front half” of the San Francisco refinery located in Nipomo, San Louis Obispo County. There it would have been minimally processed and sent by pipeline and then sent up North to “the back half” of the refinery via pipeline) in Rodeo for further refinement. The final step: The massive amounts of butane and propane pulled from the Tar Sands would sit in storage tanks constructed atop an earthquake liquefaction zone before being exported to markets overseas. Much to the surprise of those who lived in Northern California, the Bay Area Air Quality District (BAAQMD) issued an administrative permit that green-lighted the project with no public hearing. In a parallel political universe, the P66 issued an EIR for the “front half” of the refinery for a rail spur expansion in San Luis Obispo County. The Nipomo facility would have received massive amounts of the highly explosive crude by train, would have turned the population centers along the rail lines in California into sacrifice zones. The communities in both San Louis Obispo and Contra Costa Counties challenged their respective EIRs, with different results. In San Louis Obispo County, the Board of Supervisors denied the expansion permit. Up here in Contra Costa County, the community successfully sent the P66 EIR back to the drawing board several times. Ultimately, the refinery-friendly Board of Supervisors approved it. The case was heard in court in 2016. The judge declared the EIR insufficient and invalid. Note: Although P66 did not challenge the judicial decision, for reasons that are elusive to downwind communities, the Bay Area Air Quality Control District has not rescinded it its rubber-stamped permit to this day, despite the judicial decision. And now, in 2019, a refashioned EIR for the same project has been written and will be released soon.